The Advertising Standards Authority (ASA) today confirmed it was launching an investigation into No Man’s Sky. The watchdog group received ‘several complaints’ about deceptive advertising that featured enhanced graphics, large-scale combat and in-game behavioral models that never quite made it into the game. These complaints allege misrepresentation of the game itself, mostly due to screenshots and video that don’t accurately portray the experience users can expect once they’ve purchased the $60 game. I concur with the allegations of misrepresentation. There’s a lot to like in No Man’s Sky, and it’s easy to get drawn in to the experience. Unfortunately, it only lasts a day or two. Once the general wanderlust wears off, you’re left traveling from planet to planet hoping to spot a glimpse of something, anything, represented in its launch trailer. Instead, you’re met with some of the derpiest looking creatures one could possibly conceive. If you came for the dinosaurs and spectacular-looking alien species found in the launch trailer, you’re going to be pretty disheartened when you run head-on into whatever the hell this is. 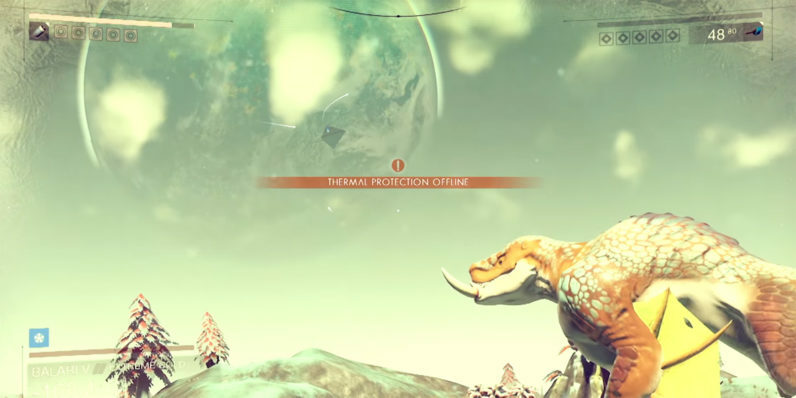 Hello Games, the studio behind No Man’s Sky, and chief developer Sean Murray have been under fire since the August launch. The new investigation could lead to advertisements being pulled, and keep them from from appearing. If an advertiser refuses to comply with an ASA ruling, the group does have the power to impose sanctions, although it’s still up to third party websites to remove the paid advertising, which doesn’t always happen. Steam, for its part, loosened its refund policy for the game. Typically, the refund has to be requested within 14 days, and the game can’t be played for more than two hours. It appears that the belt has been tightened, once again. On No Man’s Sky’s store page that notes the standard refund policy applies to the game: “There are no special exemptions available,” it states. The investigation is on-going, and as such Hello Games, Steam and the ASA have all declined to comment.